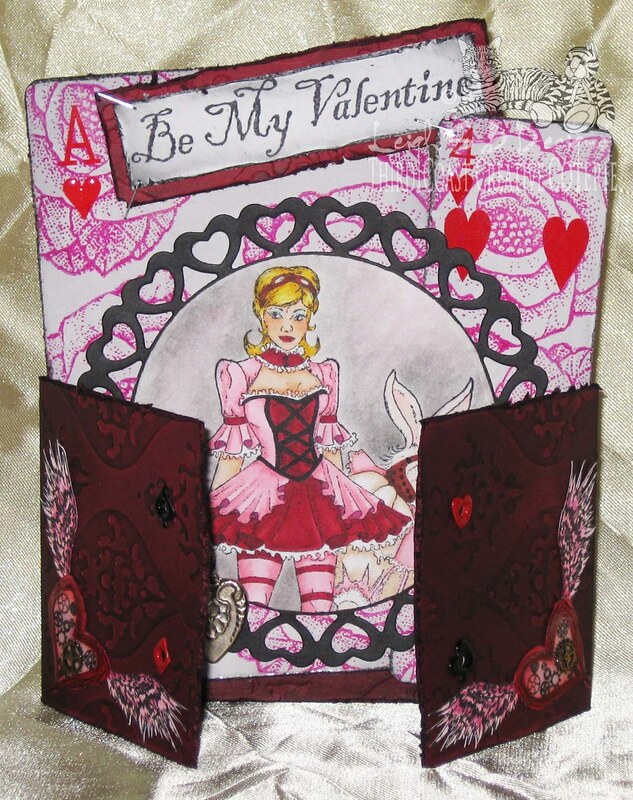 It's my turn to post over on the Third Coast Creative Coterie blog and today I'm sharing a Valentine gate-fold card with a Steampunk Alice in Wonderland theme. I always have so much fun when I can combine Steampunk with Alice in Wonderland and Third Coast Rubber Stamps' Steamy Alice KG-060-Q is definitely one of my favourite stamp images. 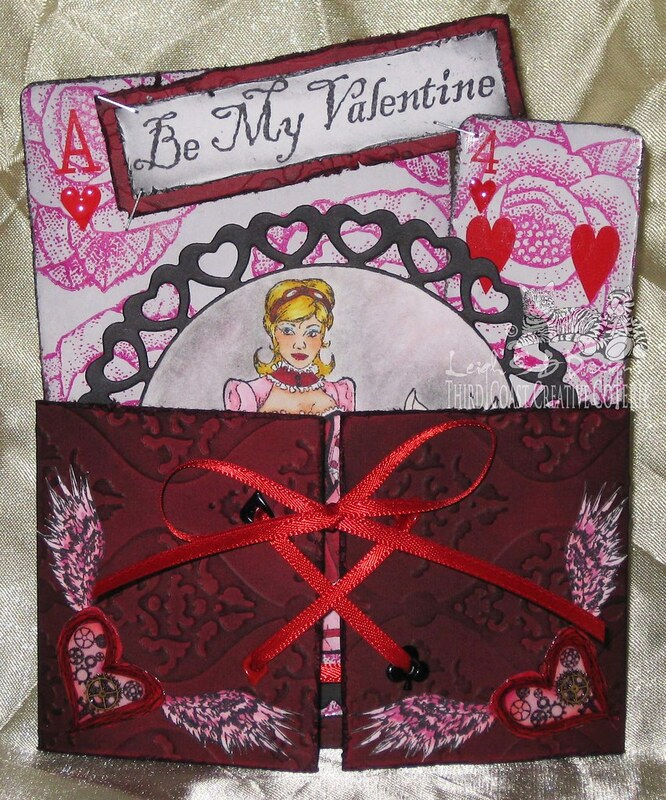 I also used Third Coast's Be My Valentine WS-102-C, Heart Rose CK-152-I and the seriously cool winged Steampunk heart rubber stamp from Smeared Ink. 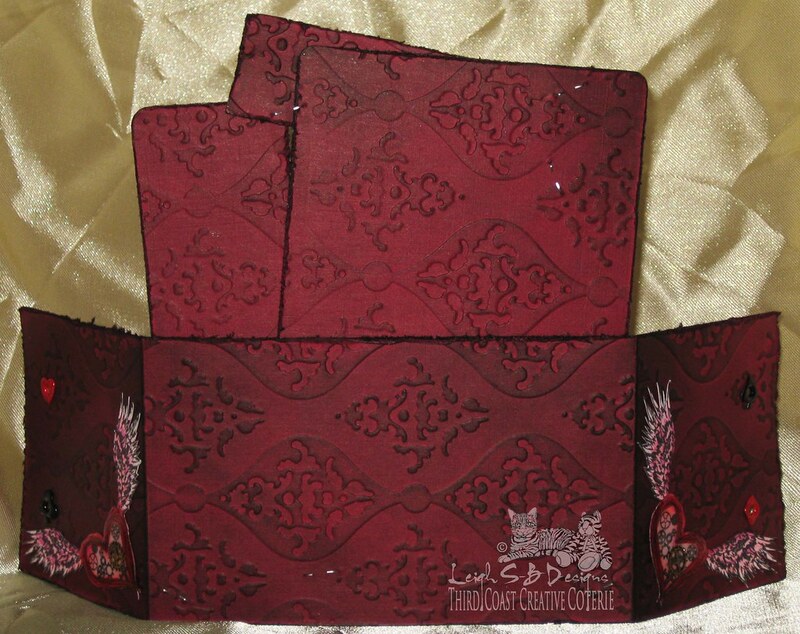 I made the short gatefold card out of dark red cardstock embossed with Craftwell's 8.5 x 11" Regency embossing folder which I ran through my eBosser machine (available at Crafter's Companion). I'm really loving this large format embossing folder :0) The fold lines were scored on a TopScore Multiboard. Stamp the Valentine sentiment on a scrap piece of Neenah Solar White cardstock with Tuxedo Black Momento Ink, cut out then distress the edges with Tim's Paper Distresser tool. 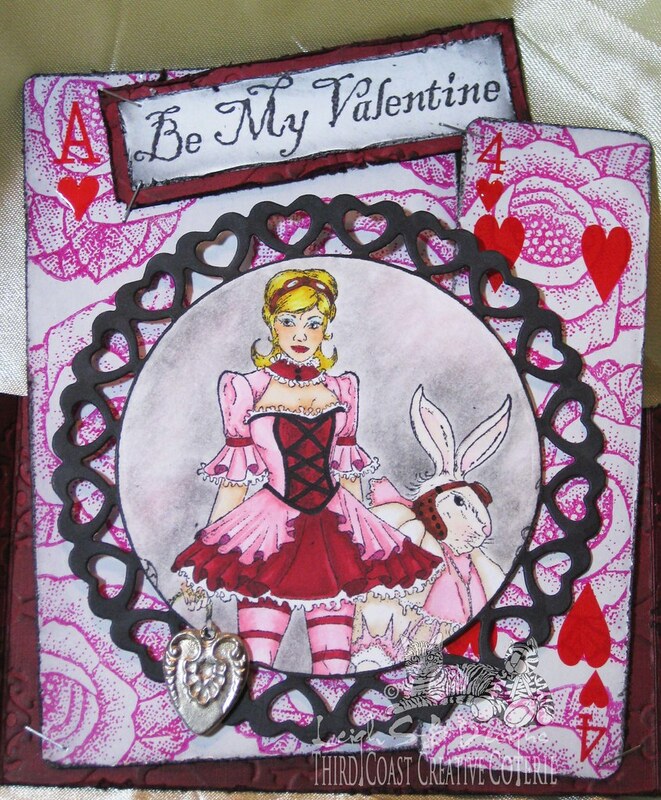 Adhere the playing cards and the sentiment to the embossed cardstock and cut out. Distress all the edges with Tim's Paper Distresser tool then apply Black Soot Distress Ink with a foam ink applicator tool to all the edges and the embossed design. Punch four 1/8" holes into the front flaps and attach Card Suite eyelets with a Crop-A-Dile multi tool. Stamp the Winged Heart image twice on Neenah Solar White cardstock with Tuxedo Black Momento Ink and fussy cut out. Colour with Copic markers then apply Inkssentials Matte Accents to just the hearts and add two mini watch cogs while its still wet. 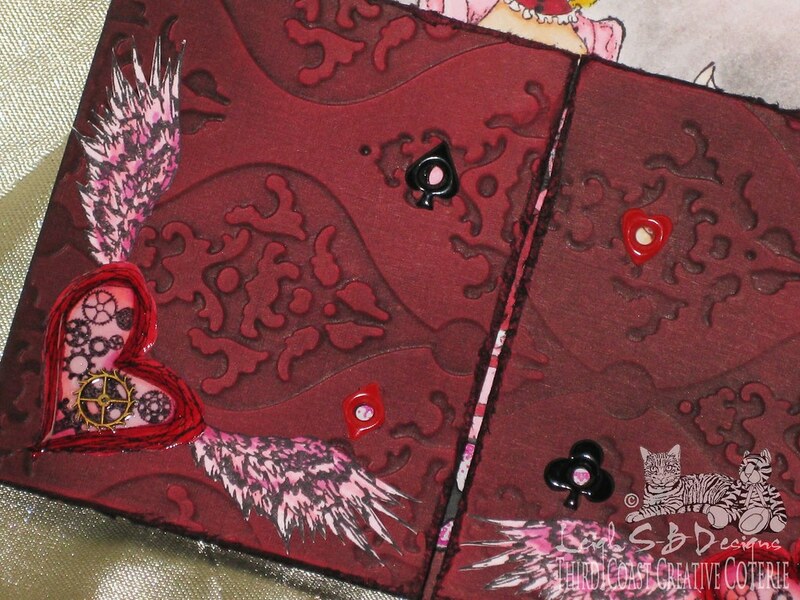 Also add the Matte Accents to the single heart beneath each Card Suite number. Adhere the playing cards and the sentiment to the card base with a touch of glue and tiny staples. Adhere the stamped die cut inside the card with dimensional silicone glue instead of pop dots and adhere the Winged Hearts to the front with glue. Complete the card by lacing up the front flaps with narrow red ribbon. The ribbon can either be tied in a bow through a single eyelet once the card is open or just removed completely. wonderful card and fun. Thank you for playing with us at Smudgy Antics. Thanks so much for playing along with The Altered Alice! What a fun Valentine and what better holiday for some steam? To fun. Love the images and all the textures. Those cards are fab! This is just way too cool and beautiful! You combined my two favorites in one card as well! I love the embossing and the coloring of Alice (she's wearing goggles!) and The March Hare. Thanks for joining us at My Sheri Crafts. Your amazing projects always push the envelope with their creativity! Love this! Thanks for joining us at Sparkle and Glitter for the Hugs and Hearts challenge. really love this! so much texture and I just love AIW. Wowzers, this one is awesome too! Love all of the textures you have going on! Love the AIW stamps too! Beautifully done! Thank you for sharing with us at Smudgy Antics! Love the gatefold card and the embossing texture! Love the fold and the coloring is wonderful! Awesome project! Love all that amazing texture! Thank you so much for playing along with us at Crafter's Companion!